The main pattern materials are wood, metal, and plastic. The selection of pattern material depends on the size, complexity of pattern, dimensional accuracy required and volume of (no of) the casting need to be make from one pattern. In this article we are about to discuss the various pattern material, their properties and application. Size and shape of the object to be casted. The surface finish and dimensional accuracy required. The possibility of design change. The wood is the most common material used for pattern making. This is because these are easy available and very cheap. The main advantages of wood is that it can be easily shaped and it possess low weight as compared to metal pattern. Wood is optimal for very large casting and small quantity production. One of the disadvantage of the wood pattern is the distortion of dimension due to absorption of moisture. This warpage can reduce some extent by proper seasoning of wood. The wood pattern undergo abrasion in large scale production. In that case it is better to use metal pattern. Most common woods used for pattern are teak, mahogany, pine, walnut, and deodar. Low weight - so they are used for large patterns. Easy to shaping, it can fabricated into any form. Change in dimension due to absorption of moisture. It may swell or shrink. Not suitable for large scale production. Abrasion occur on the surface. High dimension tolerance needed when compared to metal. Very difficult to give fine details of surface. Metal patterns are the most extensively used pattern material due to smooth surface finish. They are suitable for large scale production. Most of the metal patterns are made by casting process by using wood pattern with double shrinkage allowance. The metal patterns are durable: they undergo very less abrasion due to mold sand. So they are used for large quantity of casting. Fine surface details can be given to the pattern. Do not deform while in storage. Metal patterns are liable to rust. High cost - not suitable for small quantity production. It is hard to modifying and repairing metal pattern. Different type of plastic used for pattern making, because they are light as wood durable as metal. Thermo-setting plastic such as Epoxy resins with suitable fillers are the one of the most common material for making plastic pattern. The plastic patterns are made by using molds made of plaster of Paris or clay molds. Plastic patterns are dimensionally stable when compared to wooden patterns. They possess good compressive strength. Corrosion resistant to chemical and they can be cleaned easily. Not a good abrasion resistant when compared to metal. Sometime narrow section may need metal reinforcement. Wax pattern is not taken out like other pattern, instead the mold is inverted then apply heat. The molten wax is flow out from the mold. The advantage is that it does not cause any distortion on mold while removing the pattern. So it provide god surface finish and dimensional accuracy. Wax pattern is the excellent choice for investment casting. The most commonly used wax are bee wax, shellac, paraffin wax etc. Advantages: They are available in various thickness, they have high strength, No need for seasoning. 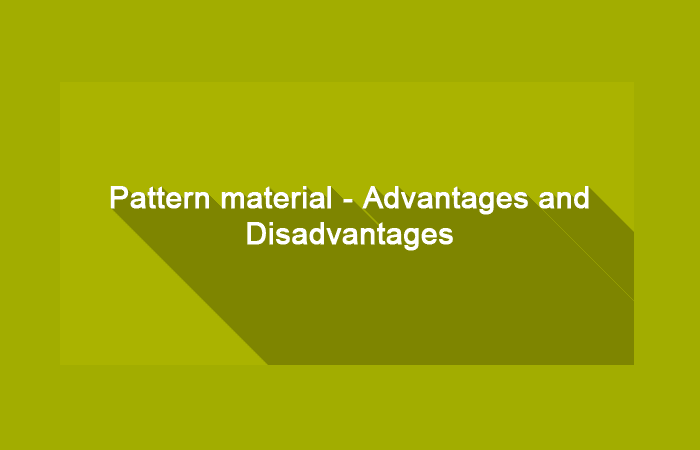 Disadvantages: They are applicable only if the patters are flat type. They can’t use to make three dimensional contours. They are very light and it can be easily formed in to desired shape. They are suitable for small quantity of light duty works. They have very low ash content if they burned so they are also used in the full mold casting process in which patterns is burned inside the mold without withdrawing. The pattern is made of gypsum Plasters (also known as plaster of paris). They have high compressive strength. Normally the plasters will expand during solidification. There are different type of gypsum plasters available. They have different expansion rate, setting time. Advantages are: they are cheap, easily workable.